* Bring peace & calm to a troubled mind. * Eases feelings of panic, anxiety & fear. A fine blend of Myristica fragrans, Styrax benzoin, Pogostemon cablin, Lavandula Angustifolia, Anthemis nobilis, Cananga Odorata. * Promotes deep, quality & restful sleep. * Brings peace & calm to a troubled mind. * Gives a positive feeling of tender & warmth. * Strengthens the defence system. Experienced problems with sleep at some time or another, whether it involves nightmares, snoring, restless partners or wakeful children. Then, a GOOD NIGHT’s sleep is suddenly all that we long for. This synergy is reputed for its warming effect on the mental and emotional level which effectively drives you to sleep restfully. It aids in making an enormous difference to the length & quality of your sleep. Simply add 6-8 drops of Blu Scents Sleep Tight pure essential oil, light up tea light candle in lower chamber then fill upper reservoir with water for a gentle diffusion of aroma & create your own restful sanctuary. Don’t let the oil burner burn dry, refill water as necessary and wash it with detergent after used. For bathing, add 8 - 10 drops of Blu Scents Sleep Tight pure essential oil to the warm bath water when the tub is 80% full. Close the door of the bathroom so the vapours don't escape. Soak for 20 - 30 minutes, breathing in deeply to get yourself relax. For foot bath, add 3 drops of Blu Scents Sleep Tight pure essential oil to a bucket of warm water, soak for 10 - 15 minutes, it is also one of the effective ways in improving your blood circulation. 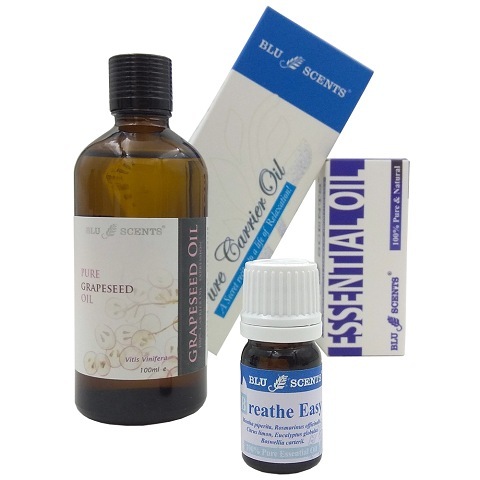 For massage, you are advised to blend 6 drops of Blu Scents Sleep Tight pure essential oil into a 10ml of carrier oil, such as Sweet Almond oil , Grapeseed oil or Organic Sunflower oil. Add in 10 drops of Blu Scents Sleep Tight pure essential oil to 100ml of water or alcohol, to make a powerful relaxing aromatherapy spray. Add 3-5 drops of Sleep Tight pure essential oil to a bowl of hot or cold water, soak the cloth, wring and apply to the affected areas.